A number of years ago I was watching the news on TV and there was a tragic report about a child who had died as result of domestic abuse. Scrolling on the TV screen was a list of the numerous occasions when this child had come into contact with health or social care services. The pressure these services were working under was acknowledged, but the question remained: why did these services not communicate better with each other to see what was happening to this child and to step in? How did they miss the signs? As well as feeling sad and frustrated, it got me thinking about my own work at Healthcare Improvement Scotland. Was there anything more I could do to help avoid issues arising in our healthcare system by helping people to communicate more openly and effectively? This was also one of the points made by Robert Francis QC in 2013 when he reported the findings from the public inquiry into Mid Staffordshire Foundation NHS Trust. He talked about the need for better sharing – within and among national agencies – of potentially serious concerns about healthcare systems. This would help ensure that concerns about quality of care are better understood and acted upon as early as possible. That’s why we established the Sharing Intelligence for Health & Care Group, a partnership between seven national agencies that enables them to share and consider intelligence about care systems across Scotland. Our main objective is to ensure that, when any of the seven agencies have a potentially serious concern about a care system, this is shared and acted upon appropriately. Sharing concerns at the right time can help identify emerging problems which can then be acted upon. In August we issued our third annual summary report. Over the last year, on the basis of intelligence shared within the group, some of the organisations responded to concerns raised about mental health services in Tayside, as well as concerns about the training environment for doctors in general (internal) medicine at University Hospital Ayr. 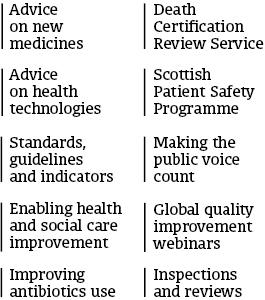 Both these concerns resulted in reviews by Healthcare Improvement Scotland and recommendations for improvements. We also heard many positive things, despite pressures on the care system, these include examples of high quality services, and also areas where improvement has been made. In addition, we heard repeatedly of instances where NHS boards had responded well to the findings from external reviews, even when these sometimes drew attention to challenging issues. Sharing intelligence must start at home. Our own organisation has grown over the last few years and we now host a broad spectrum of knowledge, expertise and experience. Our many parts, one purpose ethos certainly rings true for me and I chair a meeting every two months at which colleagues from Healthcare Improvement Scotland’s different teams get together to discuss and share what we’ve learned about the quality of care. We focus on two or three NHS boards at each meeting, and the focus is very much on learning together. It feels right to me that we’ve now got this forum to bring together colleagues from our different teams to talk about our fundamental purpose to improve the quality of care. These conversations feed into the meetings of the wider Sharing Intelligence for Health & Care Group. How will this work make a difference? If this intelligence sharing work is really going to add value then I think there are different aspects that need to work well. It’s really important that we nurture a culture and environment where colleagues feel safe sharing information, including about potentially serious concerns. We also need to make sure that we’re looking at the most relevant pieces of data and information that we hold. I think we’ve made a solid start to our intelligence sharing work, and we now need to build on this. I was pleased to see that a recent independent evaluation that we commissioned of our Sharing Intelligence for Health & Care Group work reached a similar conclusion. A recent Guardian photograph captures the essence of the need for intelligence sharing work. In the centre of the picture is a photographer sitting on an African plain and looking through the viewfinder of a long lens camera, waiting patiently to snap some wildlife action. Unbeknown to the photographer, not far behind him are two enormous rhinoceros getting amorous with each other. The caption: how did you miss that?! Hopefully, through the work that we’re doing with other agencies, and the work within our own organisation, we can look back on this photograph as a historical curio, a memory of the problems that we used to face. It will take time to get there, but when keeping people safe within the care system is the prize, it’s vital that we all keep talking and sharing, openly and honestly. Click here to read the latest Sharing Intelligence for Health & Care Group Annual Report.